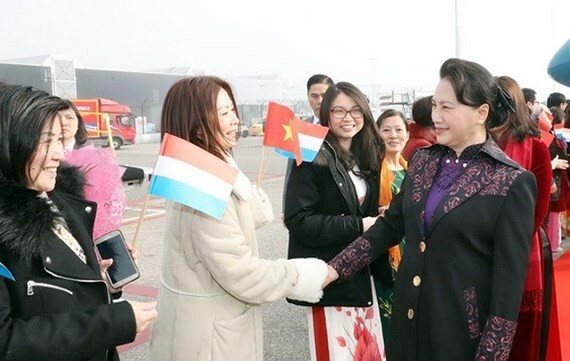 According to an invitation of Speaker of the Dutch House of Representatives Khadija Arib, Vietnamese National Assembly Chairwoman Nguyen Thi Kim Ngan and a high- ranking delegation yesterday arrived in Schiphol International Airport, Amsterdam city to begin an official visit to the Netherlands. General Secretary of the Dutch House of Representatives Frans Van Dijk, Vietnamese Ambassador to the Netherlands Ngo Thi Hoa, leaders and officials of Vietnam Embassy in the Netherlands attended in the welcoming ceremony for the delegation at the airport. This is the first official visit of the Vietnamese National Assembly Speaker in the country, bringing an important meaning in promoting further the friendship ties and multifaceted cooperation between the two nations in the context of the 45th establishment anniversary of Vietnam- the Netherland diplomatic relations (April 9, 1973- 2018).